Peel, stone then roughly chop the mango. Add the vinegar and sugar to a large pan over a medium heat, stirring until the sugar dissolves. Bring to the boil, reducing the mixture by a couple of centimetres. Finely grate in the ginger, add the garlic and bring to a boil. Reduce the heat and simmer for 45 minutes to 1 hour until it has a thick, syrupy consistency, adding the chopped chilli in the last 10 minutes only. Divide among sterilised jars, seal and behold! 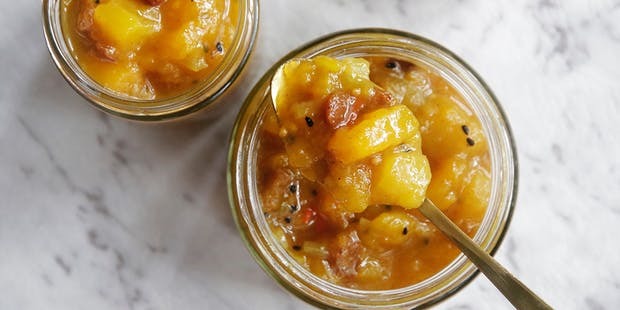 You are now a mango-chutney-master. Made extra? Why not share it with your neighbours?! It’s a great conversation starter in the lead-up to Street Feast. Alternatively, you could gift it to those who attend your event or add it to the table for that extra fancy feel. So much demand, not enough chutney! ‹ Volunteer Photographers Needed – G’wan have a go!